Welcome to the 2015 Golf Preview, where I’ll take a look at selected golfers and examine what to expect over the next twelve months. Today, we look at Jim Furyk. I’ve been watching golf for my entire life, and I can’t pinpoint the exact stage that I started to watch it critically, but I do know that for as long as I’ve been watching, Jim Furyk has been playing and doing it at a really high level. Jim Furyk has fallen out of the top-50 in the world rankings for a total of 13 weeks since June of 1996. Absurd consistency. I mean, Furyk has become a bit of a punchline in the last few years, with me taking my fair share of shots, but what he has done over the last 20 years is really quite remarkable. Furyk won his first PGA Tour event in 1995 at the Las Vegas Invitational, and posted six more wins while winning a ton of money over the next seven years until he got the biggest win of his career: the 2003 U.S. Open. After sitting out much of 2004 with a wrist injury, Furyk regained his form in 2005 and had his most successful season in 2010, winning three times, including the season ending Tour Championship, and taking the FedEx Cup. Over the years, Furyk has won 26 times worldwide, but the story recently has been more about his lack of wins, with that Tour Championship victory four years ago being his last triumph despite numerous chances and 54-hole leads. Still though, he’s currently ranked 7th in the world and despite his turning 45 in 2015, with his consistency, it’s hard to envision a scenario in which he’s not a factor. 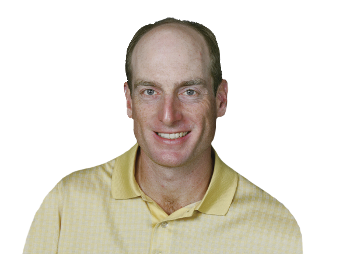 As I mentioned above, I’ve been watching golf for as long as I can remember and I can’t say that I have memories of Furyk with hair. They could have taken this photo ten years ago or ten days ago and it would still look relatively similar. Jim Furyk’s approach into 18, when going for a 59. The swing of Furyk, which David Feherty once said looked like ‘an octopus falling out of a tree’, is something that no coach would ever teach and if Furyk were 15 years old and going to get instruction, there’s no doubt in my mind that every coach would try to change him. It’s definitely the most unique swing in golf, but he really makes it work for him as the list of players who strike the ball as well as Furyk is a very short one. No one is going to accuse Furyk of being charismatic or someone who has any flare whatsoever. Ian Poulter and Billy Horschel he is not, but his consistency is something to be applauded especially when you realize that he hits the ball about as far as I do. Okay, so Furyk used to be known as a very good putter, but over the last few years, things have changed in that regard. Statistically, the numbers are nowhere near as bad as the perception though. Furyk’s ranks in strokes gained putting over the last few years: 82nd, 77th, 19th, 150th, 26th. It’s weird though because when I see Furyk stand over the ball, I never expect him to make a putt that’s over three feet, and that really started back at the 2012 Ryder Cup when on the 17th at Medinah, he lined up a putt with Fluff that seemingly took minutes to figure out, which he eventually missed. He’s done that a bunch of times since and I really don’t know what to make of it. He’s going to end his drought, right? When I previewed the 2014-15 season a few months ago, I predicted that Furyk would win a tournament and break his drought and I stand by that. A lot has been made about his recent record while holding a 54-hole lead, and admittedly, it’s not good, but sometimes you just get beat, and that’s what I think has happened a lot with Furyk. He’s still too good of a ball striker to not win at least one or two more tournaments, so as long as he can keep that up, he’s going to be just fine in 2015.